When out on the road, the artists are often asked to do on the spot interviews, which we are happy to do. 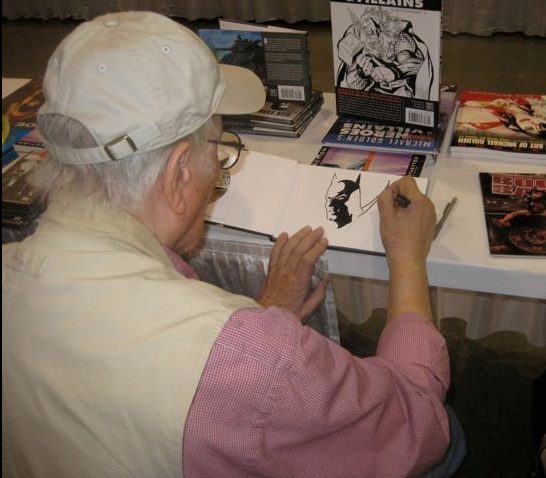 This particular one took place at Wizard World Atlanta, and features the amazing Mr. Golden talking about one of his groundbreaking works, "Star Wars" #38. Today we’re here with Michael Golden, comic book artist extraordinaire. I had the honor of getting a chance to chat with Michael at Wizard World Atlanta. Golden is responsible for co-creating some of the most beloved comic book characters, chiefly Rogue and Bucky O’Hare. Working with the two largest comic publishing houses, Marvel and DC, Golden became one of the most prolific mainstream comic book artists. 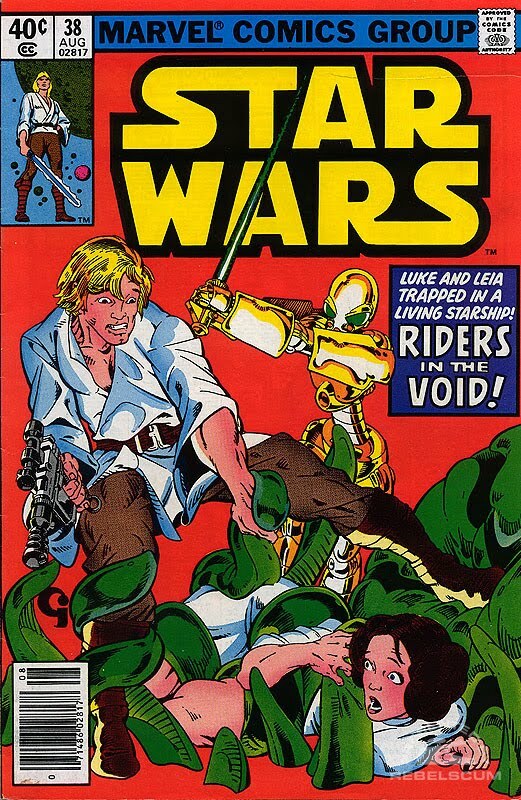 For the discerning Star Wars fan, Golden is responsible for one of the most popular and well-known single issues of Marvel Star Wars comics, Star Wars #38: Riders in the Void. Mandy B: Michael, what led to you working with Marvel to create Star Wars #38? Michael Golden: Originally, Star Wars #38 was just me walking into Archie Goodwin’s office one day going, “you know I would like to do more science fiction,” because at that point, everything I did at Marvel was science fiction: I did Logan’s Run and was co-creator of the Micronauts. I liked doing science fiction and I was never much into superheroes. So, at that point, when I was in Archie Goodwin's office I said, "I got an idea for a story that I want to do," and we sort of simultaneously said we could attach it to Star Wars as a fill-in issue. I told Archie this story that I wanted to do and he loved it, so I sat down and drew it and Terry Austin inked it. After I had sat down to the drawing it, Archie actually called me and said they were actually going to use the story right away, so I finished up the pencils and it went off to Terry Austin to ink. I was originally supposed to write it as well, but because they needed it right away, Archie sat down and wrote it based on my notes. MB: It was still your story, right? MG: Oh, yeah! It was still my story, but he went in and made it work. MB: I'm fascinated with this issue, Michael. In what’s referred to as the Star Wars Expanded Universe, a host of authors was tasked with creating an exceptionally long series called the New Jedi Order centered around a galactic threat that is seemingly modeled after some aspects* of Star Wars #38. Can you confirm that this was based on some elements of your story? MG: I'm aware of that and everyone who's brought it up has been of the opinion that it was based loosely around my idea and what I created. And that's really cool! I don't even have a problem with that. 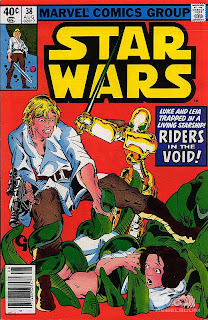 I think it's great that the issue is acknowledged as one of the great standalone Star Wars storylines. It was always a science fiction story I wanted to do, so we just decided to make it a Star Wars story because we didn't have any other venue. Archie really liked the story and it ended up being one of the most popular issues from the Marvel round of Star Wars. MB: I also think that your art was a breath of fresh air in the series. Compared to the previous artists, there is an obvious difference and unique quality to your work. MG: Thank you, thank you very much! MB: If Dark Horse, the current publishing house for Star Wars comics, asked you to come onboard and gave you carte blanche with regard to plot and characters, what would you like to do? MG: I honestly don't have a preference. I like the Star Wars license. If somebody were to drop it in my lap, I would do it in a heartbeat. I think it's a really great property and I'm a hard-core science fiction guy. Though Star Wars is more science fiction adventure, whatever anybody wanted me to do, I would do it. MB: Michael, thank you so much for your time! It was a pleasure to meet you! MG: Thank you, and you as well! *Author’s Note: What I’m referring to is the galactic threat known as the Yuuzhan Vong. Introduced as a force to be reckoned with in Vector Prime, the odd alien race seems similar to the mysterious “organic” aliens that Golden used as a part of his comic. Thanks to www.theforce.net for a great interview! 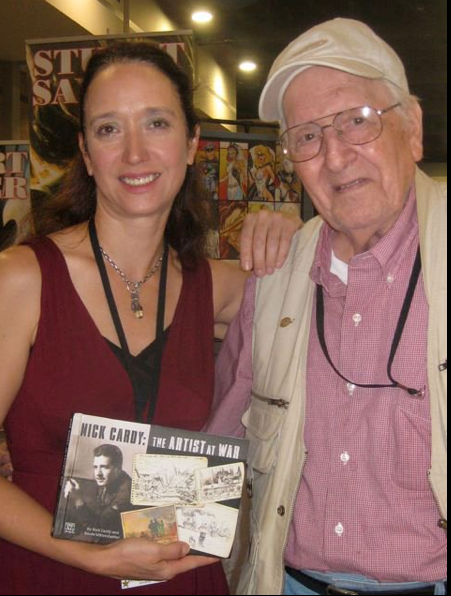 And a store owner tells me what he thinks about our new book, "Nick Cardy: The Artist at War." Thank you Jason! 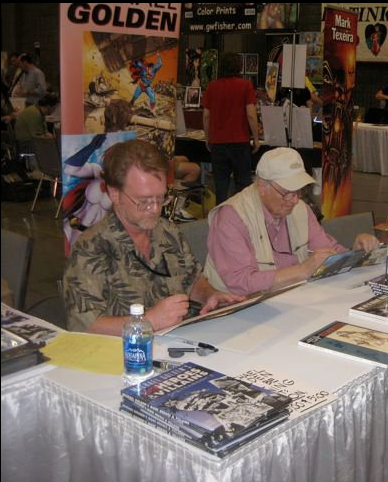 In these photos as well, Nick Cardy and Michael Golden at Heroes Charlotte, 2011, Nick sketching in the new book, Nick and I with our current project on his war journals. Right off the bat, I've got to say that it was my pleasure to purchase, read and review Artist at War. You guys did a great job putting it together and I'm all too happy to recommend it here in my shop, Strange Adventures in Fredericton, New Brunswick. Like many comic fans, I was familiar with the name and a portion of Mr. Cardy's tremendous body of work, but his interview on Where Monsters Dwell was absolutely compelling! So when I learned of the book you were publishing, I just had to have it! Thanks again to you and everyone involved in compiling Mr. Cardy's work for this beautiful production. Nick Cardy, like many from his generation, has provided us with plenty to be grateful for. His work in the comics industry has been legendary and an influence on many since its golden age. If the name isn’t ringing bells yet, just check out some of the work he did alongside the likes of Eisner, Schwartz and Infantino, just to namedrop a few. It’s his service in World War II though that is the focus of the highly recommended, wonderfully presented, illustrated autobiographical book “Nick Cardy: the Artist at War”. A fresh faced, 20 year old Nick Cardy was drafted to serve in the war on April Fools’ Day of 1943 no less. Starting right at basic training, Mr. Cardy deftly and clearly captured many sincere, telling moments from a young man’s experience in the army. His illustrations continued all the way through to the end of the war and a selection of these have been beautifully presented to us by Renee Witterstaetter and Little Eva Ink in a 128 page, full colour hard cover gem. I’m lucky enough to have purchased an edition with an interview disc and autograph from Mr. Cardy himself. To say Mr. Cardy’s recollections are compelling would be an understatement to say the least. The chosen text for the book and the video interview glued me to my seat. The life he manages to capture in his sketches, drawings and paintings is the kind only described by the thoughtful eye of an illustrator/painter. While the photographer takes a moment to freeze a moment, the contemplation of the pencil, pen and brush (as brief as it might be in such a volatile situation) somehow gives me a greater sense of connection as a human being to the individuals and events surrounding Mr. Cardy in the service. The images range in mediums, techniques and intensity, but the constant beat of the notepad format (thank you for not cropping!) gives the read a steady rhythm. It’s easy to see an evolving view of a world-scale event through the eyes of an individual, due in no small part I’m sure to the selection and arrangement of the chosen pieces. All in all, this handsome book is worth the price of entry and then some. The subject was a monumental event that changed the world and the intimacy that “Nick Cardy: the Artist at War” gives it is riveting. It’s an honour to have read it/heard it from the gentleman himself and on the off chance that you are reading this Mr. Cardy, I sincerely thank you. Hey Everyone-- Just an update to let you know that Michael Golden and myself are at the San Diego Comic Con, this weekend, July 20-24th. We are located at Booth 4601, aka Naked Fat Rave. Also at the booth are fantastic artists--joining the wonderful Mr. Golden--Amanda Conner, Arthur Adams, Phil Noto, Bruce Timm, J. Scott Campbell, Alan Davis and Scottie Young. All of the artists are sketching and/or offering sketchbooks and prints for the event. Michael Golden has prints, sketchbooks and artbooks, and is sketching during the show, while I have copies of my new books "Nick Cardy: The Artist at War," and "Kerry and the Scary Things." Come on by. NFR, Booth 4601. It's the place to be. Hi Ya'll-- With all the archive posts, I admit, I must resist the urge to rewrite, add to, update. But if I did so, then they wouldn't be archive, would they? And they would not be preserving the moment in time in which I wrote them, or the emotions I felt on that day. The editorial below originally appeared in one of the "Marvel Holiday Specials" that I edited while at Marvel Comics. I was particularly fond of this project, which I conceived and spearheaded, and always had such fun working on this particular book. 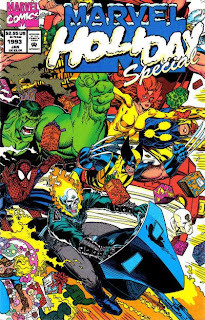 Mainly because it gave me the chance to work with so many creative people at one time, and the task of weaving numerous anthology stories into a cohesive whole under the umbrella of the title. This issue contained works by: Arthur Adams, Al Milgrom, Brad Joyce, Darick Robertson, Ed Lazellari, Evelyn Stein, Fred Fredricks, Jim Starlin, John Costanza, Keith Williams, Larry Hama, Michael Golden, Patty Cockrum, Rik Levins, Ron Lim, Rurik Tyler, Steve Montano, Tom Grindberg, Tom Vincent, Ann Nocenti, Bob Wiacek, Carl Potts, Dave Cockrum, Ernie Chan, Fabian Nicieza, Glynis Oliver Wein, Joe Rosas, John Hebert, Kerry Gammill, Larry Mahlstedt, Mike DeCarlo, Peter David, Richard Howell, Ron Garney, Roxanne Starr, Sal Buscema, Steve Lightle, Terry Austin and Tom Morgan. And now for my little contribution. Horton the Elephant! You remember him? How could any of us raised on Dr. Seuss and Cats in Hats forget? I never have. Amongst the gobs of goo, and the Grinch that stole Christmas, that likable elephant has always been my favorite. Why? Because he seemed so, well… human. He had the same doubts and fears. He was put upon by friends and teased by enemies. He was quite happy to go through life unbothered and undisturbed. That was until one day he heard a very small "Help" come from a dandelion, and he discovered a parallel world, smaller, but none-the-less as important, as his own. At that point, he also discovered the hero inside himself. Sometimes it IS the small things that make us think. Let me give you an example. On a recent trip to Hong Kong, stuck in my room with violent monsoon storms raging around me I occasionally looked out the window at the dark foreboding sky and the sheets of water literally dancing down the street. And there , perched precariously on my ledge was an egg--an odd place to lay one for sure, and a mistake I'd hope not to make if I were a pigeon. But, my heart still went out to that little egg as, like Buster Keaton on roller skates, it would dash for the edge then roll back at the last possible moment. The poor mother would come back often to frantically try to help it. And there was nothing I could do since my window wouldn't open. Helplessness is not a good feeling. The last time I went to check it, the egg was gone. Later, my friend Jackie picked me up and told me of the terrible destruction on Hong Kong Island caused by the storm. Mudslides had killed several people, and floods threatened the homes of many others. We were both silent…there was no other place in the world, no other moment in time, than where I was right then. With storms raging all around us, the events that happen right before our eyes somehow seem so much more real. It's that way with us. Until something slaps us in the face we don't really believe it's there. It's some vague, make-believe thing. Are there really only a thousand giant otters left in the world (Writer's note: Insert any number of endangered species)? Are people really being killed in Bosnia (Writer's note: Insert current country)? It's so far away from the streets we walk every day. Few of us take to heart the words of the writer who said: "I may never see a mountain gorilla, but I take great joy in knowing that they exist." 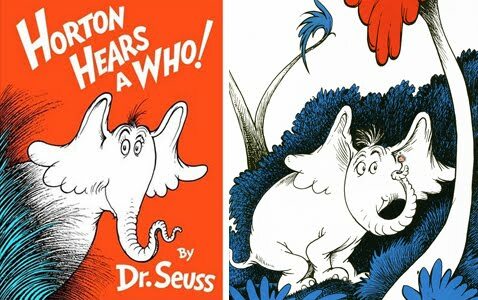 But, this is where we can learn our lesson from Horton. Remember, the elephant who is faithful "one hundred percent." We could take this time of year to look past our own limited field of vision and be faithful to something-- a charity for hunger, disease or endangered species, perhaps. Give to it, watch it grow, learn about it…occasionally go to the window and see if it's alright. You might not hear that still small voice saying "Help" or even "Thank you." You may never hear it…but then again, you just might. Something to think about . Happy Holidays. Limited Edition "Shi" Print Supports Breast Cancer Research! Hi Everyone-- As some of you who know me personally may be aware, I have had people in my life who have dealt with, battled, and survived Breast Cancer. But the battle is a hard one...the war never guaranteed. This is a cause close to me. One of my dear friends, artist Billy Tucci, who also is familiar with this disease, currently has a limited edition print of his creator-owned character "Shi," available on e-bay. Sales of this beautiful piece go to support Breast Cancer research. I bought one. How about you? Not only does your purchase help with much needed research, but you also have a beautiful gift to keep for yourself or give to a friend. What a meaningful way to start the month of July--helping find a way to give all suffering from this disease, a little "independence" and "freedom" from worry and care. And hope for a future without this specter. Everyone is afraid of something. As a matter of fact, the business of phobias has kept uncountable psychologists, analysts, and pharmacies busy for nearly a century. “Kerry and the Scary Things” is not about phobias, but rather a deep fascination with all things monsters. Frankenstein, the mummy, werewolf, vampires, and the cyclops are the ‘hit’ list of young Kerry and his companion book, Dr McNamee’s Monster Guide. You see, there are very precise methods to fight such beings. It really is true, even monsters who inspire phobias themselves have phobias. 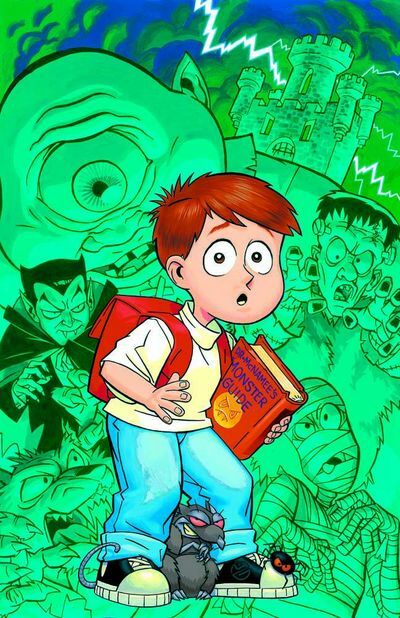 Alas, young Kerry is NOT afraid of such things, and when he meets Dr McNamee, he is drawn into Monstercity and lives the life of Kerry, Monster Hunter! Renee Witterstaetter and Keith Wilson give readers a delightful book that will hit monster fans right in the face. Everyone loves a mummy, and everyone loves the wolfman. And vampires, the ‘tame’ version, #1 on my list. An interesting aside is that Kerry, in the book, is named after artist Kerry Gammil, monster lover, and now a monster publisher himself, and in this book, his namesake, truly is brave above reason! Well done Renee and company. Great book.